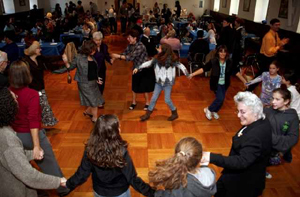 Since 2001, students from Perelman Jewish Day School’s Stern Center and residents from the Stiffel Senior Center have met annually for a day of intergenerational activities. At the 2008 event, one of the seniors mentioned that he had been unable to have a Bar Mitzvah when he was young because he had to begin working to assist his family financially. Thus, a new idea was born: to provide Stiffel Center seniors the opportunity to celebrate a Bar/Bat Mitzvah, as it is never too late, within the Perelman Jewish Day School community. The idea came to fruition on Monday, October 26, 2009 as Perelman Jewish Day School students in the third through fifth grades helped five members of the Stiffel Senior Center celebrate their B’nai Mitzvot. 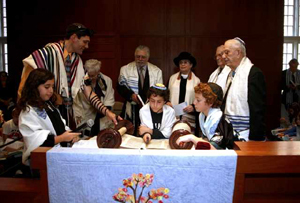 At a service attended by the students, teachers, and friends and family of the seniors, each of the B'nai Mitzvot were called to the Torah accompanied by a fifth grade student. The participants each read a portion from the Torah. Then the fifth graders conducted the rest of the service and all of the students sang songs of celebration to the B’nai Mitzvot to honor their special achievement. As with many such celebrations, this one was followed by a luncheon and dance in which the B’nai Mitzvot, their guests and the fifth grade students took part. They shared stories and thoroughly enjoyed each other's company. It was a very special day. Benjamin Loeb remarked that stepping up to the bimah he felt nervous reading the Torah by himself for the first time, but once he got started he was glad to participate in the bar and bat mitzvah of three seniors. After this, his own bar mitzvah three years from now should be a piece of cake. Stern Center Principal Wendy Smith, in a letter to the school families, wrote of the event: “Perhaps our students do not fully recognize the importance of this day, and the impact it will have on their lives, but I fully expect that later they will look back and realize that they truly are a part of going "from generation to generation (L’dor V’dor)".